Latest FCOM version is ? FCOM odometer correction module allows you to change mileage shown on instrument cluster to any requested value. The feature is very simple to use: Connect via OBD2 to instrument cluster, select coding functions -> Direct odometer change and enter desired value. Everything is carried out via OBD2 connector, no need to open any control units or solder anything. 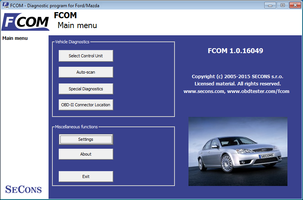 The FCOM odometer module is currently available only in form of beta version. It was tested on many control units, however it is possible some less frequent ECUs may not work. We'll fix these problems as quickly as possible after reporting. All customers will be provided with free updates fixing all resolved issues. Please see known bugs below before ordering. Notice: It is not possible to change odometer via OBD2 if your car is not listed and it was manufactured before models listed below (e.g Mondeo 2001-2006, Focus up to 2003, etc). Older instrument cluster modules do not have capabilities for direct memory access via OBD2. The FCOM odometer correction module allows you to change mileage of a car both ways, up and down. This feature is useful in many situations (typically instrument cluster or engine replacement), however it can also be used for odometer/mileage changes (rollback) that are considered as fraud in many countries (typically when the seller of a vehicle falsely represents the actual mileage of a vehicle to the buyer). FCOM users are not permitted to use odometer correction function for fraudulent purposes. Where this function is not permitted by laws of your country, the FCOM module must not be purchased or installed in the first place. 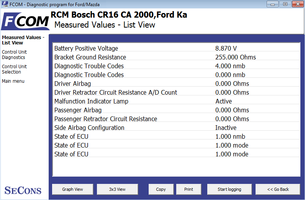 Important notice: in order to use FCOM odometer correction module, you already need to have our FCOM diagnostic interface (comes with FCOM software). If you do not have FCOM yet, please order one from this page. The module does not ship - you will be able to download it via Internet after we receive your payment. Please use our contact form to get more information about FCOM odometer correction module.